By Gregory Berns After spending the last two years training dogs to go into an MRI so that we can figure out how their minds work, you'd think I would have a household full of perfect canine citizens. But that is far from the truth. While Callie is the superstar of the MRI project, Cato is an irrepressible plotthound and is the hard-to-love member of the household. I've thought about scanning his brain to see why he's so messed-up, but none of us think he can learn to go in the MRI. He is so bad that we had to adopt a third – a lab-ish dog named Argo – just to dilute Cato's naughtiness. I first met Cato a month after my daughter's golden retriever died suddenly at the young age of seven. After a brief period of grieving, my wife and I gave into Helen's request for another dog, and we made the trek to the Humane Society. Helen zeroed in on a fluffy brindle puppy, and I did some basic puppy temperament assessments. He didn't flail about when picked up. A good sign. He trotted over to a crumpled piece of paper in the corner of his pen and brought it back to me. Another good sign. And then he rolled over on his back for a tummy rub. I remarked to the shelter volunteer how calm he was. She shrugged and said, "The puppies get handled a lot around here. Sometimes they're just tired." Helen was smitten, and I didn't pay any heed to the volunteer's warning. We have had seven dogs over the years, so I have some sense for what is normal. 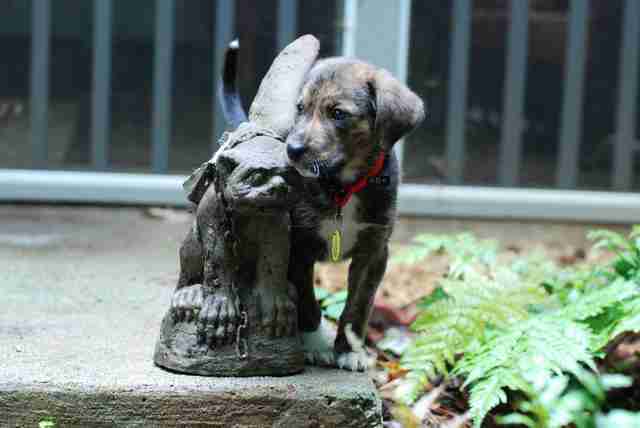 From the moment he stepped into the house, Cato was different. He didn't wag his tail. There was nothing physically wrong with it. Sometimes his tail arched over his back, and other times it laid out flat in repose. But wag? The best he could muster was an uncoordinated slow undulation. Not only did this make it hard for me to read his emotional state, I think it confused the other dogs, who may have mistook his body language for a threat. Crate-training was a disaster. Since there is usually a human around our house most of the time, we have housetrained our dogs simply by taking them outside frequently. This way, they get used to doing their business outside. We use the crate for sleeping at night until the dog is old enough to sleep quietly in one of the human bedrooms. But Cato barked and howled in the crate to no end. He wore us down. After the first night, he ended up sleeping in our bedroom. As he got older, the barking only got louder. I should have known about this. Plotthounds were bred as big game dogs and to track bear and hog. They have a choppy bark that carries long distances so hunters can follow them through the woods of the southern Appalachians. With few bear around the house, Cato directed his energy at articles of clothing, pillows, furniture, and the window casings. He never seemed to get his footing socially with the other dogs. I believe his lack of a tail-wag made him some kind of canine autistic, and he quickly fell to the bottom of the social hierarchy. Much to Helen's distress, he wriggled away every time she tried to hug him. This was a dog who had trouble fitting in. He would be the kid in middle school most likely to be picked on. 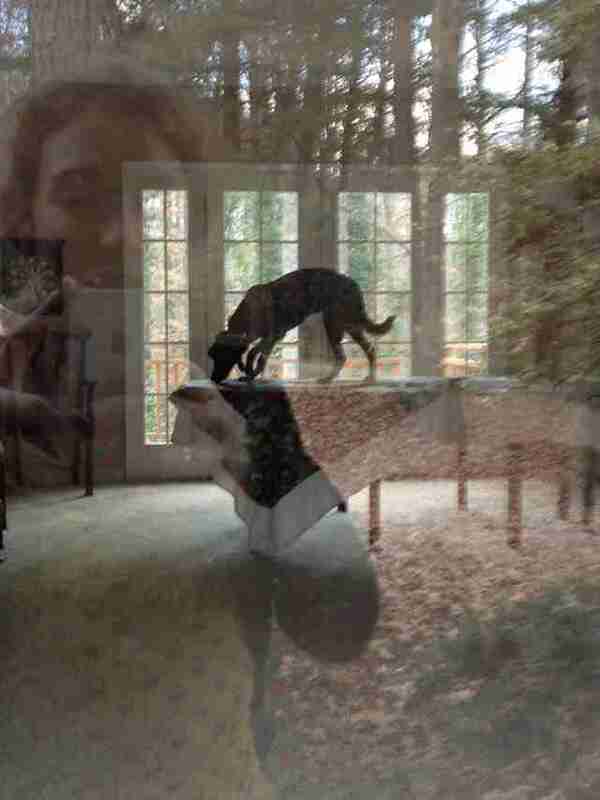 Helen had high hopes that Cato could be trained to go in the MRI, just like Callie. I mean, isn't that what all of us want? To have the means to communicate directly with our best friends? Helen did her best. She practiced with Cato in a mock head-coil to teach him to hold his head absolutely still. But when it came to teaching him to walk up the steps into a tube that simulated the bore of the real MRI, it became apparent that Cato was just too nervous. And forget about the noise or the ear muffs that would be needed to protect his hearing. The dog was already afraid of thunderstorms. With great reluctance, Helen admitted that Cato was not a good candidate for the MRI and that it would be unfair to make him do something that he so clearly was not cut out for. But it was only after this failure that I began to think seriously about how the MRI project could tell us what was wrong with dogs like Cato. To be fair, there was nothing wrong with Cato. 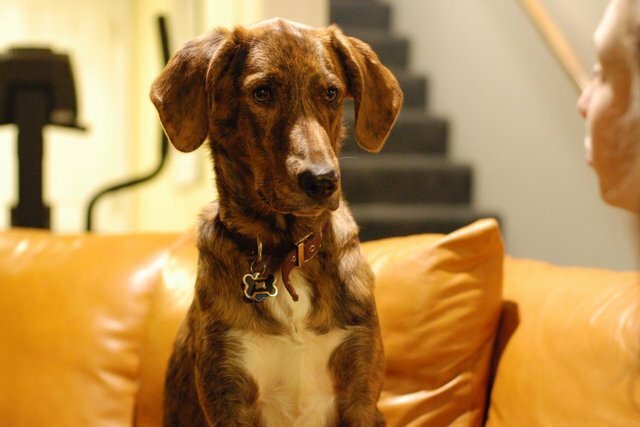 He was a discarded plotthound whose innate skillset was not well-matched to a suburban lifestyle. There are millions of dogs in the same predicament. One of the findings from the MRI project is that the part of the canine brain associated with reward can respond to different types of reward. When we began, we focused on how this part of the brain responded to food. But this was just a proof of concept. Since then, we have been measuring how the dog's reward system responds to social signals like the presence or absence of their humans, or the smell of their human. We have even begun measuring the brain's response to pictures of their humans. It is becoming clear that dogs, like people, respond to these types of social signals regardless of the form they come in. And this tells us something important about living with difficult dogs. Dogs have free will. They make choices. If they do not do what we want them to, then it is because a more attractive alternative has captured their interest. The usual way that humans attempt to bend dogs to their will is by changing the value of the options. With "positive training," the value of the desired action is increased by associating it with food or play. This is very effective for most things that a dog should learn, like walking calmly on a leash or coming when called. However, there are certain circumstances in which no amount of food or praise will divert a dog from his intent. If a dog really wants to chase a squirrel, there may be nothing you can offer that will be of higher value. It is in these circumstances that humans will resort to what many trainers have called the dark side: punishment. By definition, anything that decreases a behavior is a punishment. A leash correction is a punishment. Blocking your dog from running out the front door is a punishment. Yelling, hitting, shock collars are all punishments. I was tired of yelling at Cato. The barking had become so incessant that neither dog nor human wanted to be around him anymore. There had to be a better way. Even though Cato was not going to be an MRI-dog, the answer lay in the MRI data we had been collecting in the other, well-behaved, dogs. Although parts of the dog brain look and function just like the corresponding parts in human brains, dogs largely lack a big piece of neural real estate: the prefrontal cortex. The PFC is crucial to complex human cognitive functions like planning, abstract thought, and the ability to inhibit our emotional impulses. I realized that Cato's problem was not one of misunderstanding what I wanted. I think he knew what was expected of him. The problem was that even with such knowledge he couldn't inhibit the overwhelming urge to bark, tear up clothing, or swipe food off the counter. So I began a new training program. This new training regimen would be aimed at building cognitive control. I believed that if Cato could learn to control his impulses – just a little – not only would he be a better companion, but maybe he would gain enough self-confidence to fit in better with the other dogs of the household. To begin, I focused on barking. Whenever Cato was barking, he would not get what he wanted. Only when he stopped barking would he get his food, a treat, or to be taken on a walk. This way, Cato would learn that good stuff came from not doing things. Cognitive control is hard, even for people. The heart of control is to not do something you really want to do. It takes all of our prefrontal cortex to exert this type of control, and if our attention is diverted by stress or tiredness, control goes out the window and our basest desires hijack the body. This is why New Year's resolutions are doomed to fail. Imagine how hard it is for a dog to exert cognitive control. Cato still barks incessantly. But now, when leashing up for a walk, the cacophony is a tiny bit less. He sometimes throttles down to a whimper, seemingly knowing that if he lets his freak-flag fly, the door will not open. So I am hopeful. Maybe someday he will even pull it together enough to go in the MRI. Gregory Berns, MD PhD, is the Distinguished Professor of Neuroeconomics at Emory University. He is the author of How Dogs Love Us: A Neuroscientist and His Adopted Dog Decode the Canine Brain (Amazon New Harvest, October 2013).